Check out some of WhyHunger’s latest Artist Ambassador campaigns & impacts! Join the ranks of these amazing artists to make an impact! From donating auction items or collecting donations at a show, to helping spread the word or hosting a Homemade Jam, there are so many ways that you can be involved. 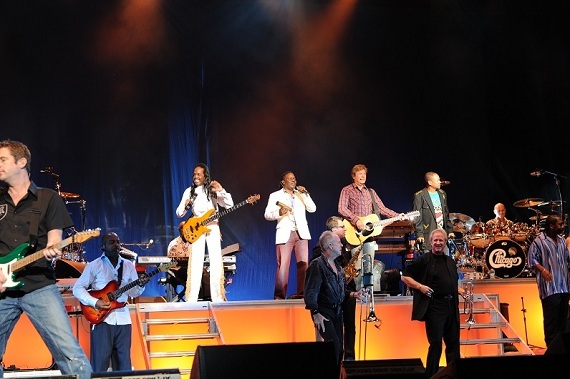 Chicago and Earth, Wind, & Fire provided more than 120,000 meals and raised thousands of dollars for WhyHunger via their song download campaign in which fans could donate $3 or 3 food items in exchange for access to 3 unreleased songs. O.A.R. collected more than two tons of donated food at one show -- all of which went to restock the shelves at New York Common Pantry in East Harlem, NY during a time when they were almost out of food for their community members. Over 20 years, Bruce Springsteen has raised millions of dollars in support of over 130 grassroots organizations while on tour, helping millions of American families get nutritious food. During Santana's residency at Hard Rock Hotel & Casino, he toured and volunteered with WhyHunger's partner Three Square Food Bank, and held a press event to generate awareness and funds to help the more than 165,000 children who face hunger in and around Las Vegas. Through Yoko Ono Lennon's generosity, Imagine There's No Hunger has supported programs that taught more than 47,800 community members techniques for sustained food production and has raised more than $6.8 million to help fight childhood hunger. Michael McDonald has donated over 500 tickets with VIP access and personal meet and greets all in support of making a difference in the lives of the hungry in each tour city. Explore artists driven partnerships and support WhyHunger's work to end hunger and poverty.